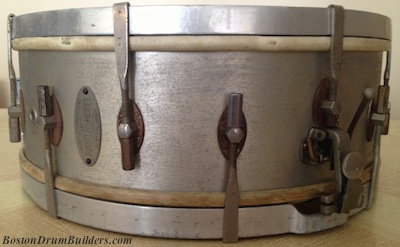 My goal is always first and foremost to preserve an antique drum in as close to original condition as possible. The more aggressive one's approach to 'restoring' a drum, the less of the original is left for future generations to discover. 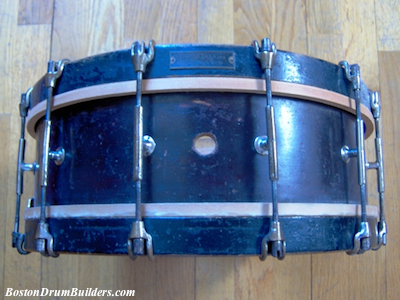 One hundred years from now, a drum's owner should not have to decipher what is factory original and what is a misguided attempt at restoration. 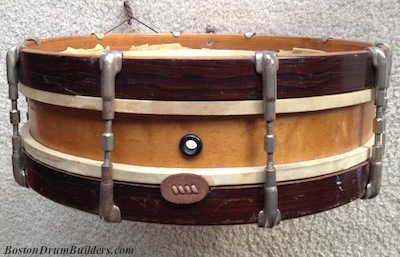 That being said, a variety of different approaches may be appropriate when addressing the condition of an old drum. Nothing is cut and dry here, but these are the three basic options with a bit of room for interpretation within each. 1.) Strict Preservation. Leave the drum virtually untouched. Rust, corrosion, and broken heads remain. Only the lightest, most gentle cleaning is done. 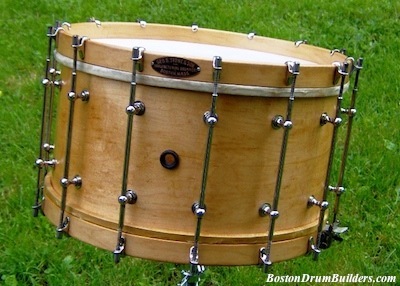 This approach is recommended for very antique instruments where any tampering could potentially devalue the drum. Patina can be a good thing after all! Once the age is wiped away, it can take decades to return so think twice about cleaning a centuries-old antique. A good candidate for this kind of hands off approach would be an original 18th or 19th century rope drum which still has period heads, rope, and leather ears intact. 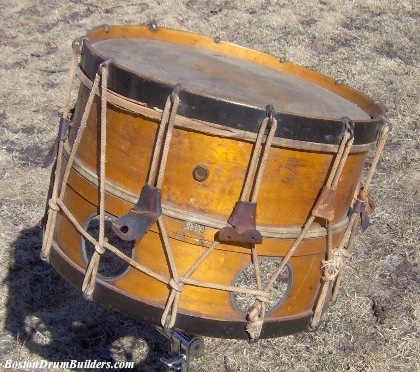 1880s George W. Bemis Rope Drum in 'as found' condition. 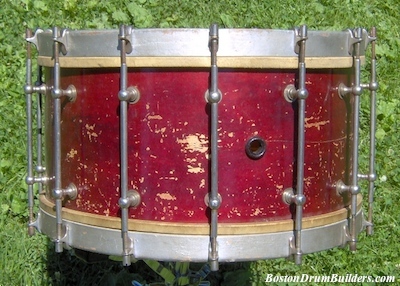 Unless the drum is incomplete or badly damaged on arrival, only the least invasive cleaning techniques should be used. And unless it has already been converted into a player drum as is sometimes the case, resale value and collectibility in general tend to be adversely affected by any significant alteration to the instrument. Just leave the drum alone and appreciate it for what is is! 2.) Soft Restoration. Gently clean what is left of the original finishes without modifying anything. This to me is still preservation over restoration. It maintains a drum's character and leaves it with a somewhat aged look but helps preserve the instrument and protect it from any further decay. It is important to still keep the instrument in as close to original condition as possible. This is my default approach to cleaning most drums, especially the early 20th century Boston-made drums which I collect. The level of cleaning and polishing used can be catered to each case but care should be taken not to over clean an antique instrument which can leave it looking over-restored. I typically like to replace broken heads with new calfskin, and gently polish the hardware and shell with products which are non-abrasive and safe for the particular finishes. Abrasive cleaning products should be avoided as antique nickel plating and shellac finishes are especially delicate and can be irreparably damaged with very little effort. Several cleaning products with which I have had success are detailed in a previous post. Ideal candidates for this type of treatment would be instruments which arrive in fair to good condition and need no significant structural repairs or replacement hardware. So long as the original plating and finishes are in decent condition, shine up what is left and let the drum show its age! The two drums pictured below are examples of 'soft restoration'. 3.) Full restoration. This may include the refinishing of wooden shells and hoops, re-plating of metal hardware, replacement of missing parts, and repairs to damaged shells and hardware. This approach is only advisable in extreme cases where the original finishes are already completely destroyed and no real value, financial or otherwise, is being lost. When work is done, care should be taken to use period correct materials and techniques when at all possible. 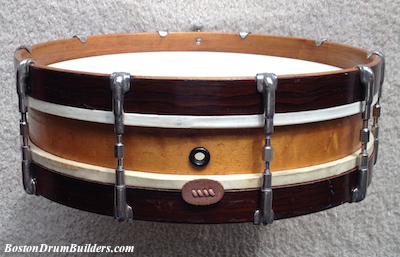 Value is rarely added to antique drums by completely restoring them. 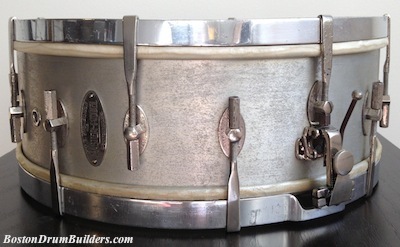 Most collectors would much prefer to bring in drums in original condition, flaws in all, than instruments which have already been completely overhauled. The two drums pictured bellow have undergone significant restoration. 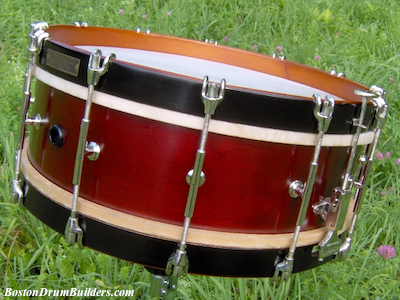 Both drums were in poor structural condition, had been previously refinished, and were missing hardware on arrival.